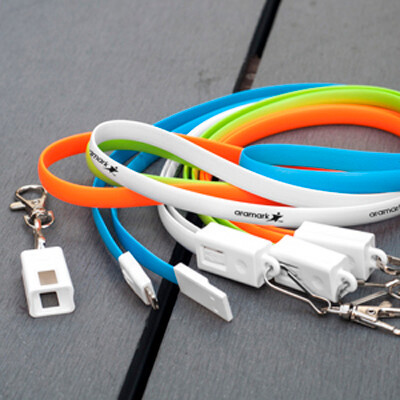 Features: The Mack lanyard is a creative advertising cable that provides both charging and data transfer options. TPE covered 2A cable, ABS locking head with snap hook, suitable to be worn around the neck.� Ideal for trade shows, conferences, concerts, etc. �Combined micro USB and 8Pin connectors. Material: ABS, TPE.. Certification: CE. Product Colour: Black, Blue (Light), Green (Lime), Orange, Red, White. Product Size: 35 x 16 x 11 mm, 90 cm (lanyard cable) . Print Area: 30 x 4 mm, 12 repeats. Print Process: 4CP Direct Digital. Delivery: 2-4 weeks (indent) from art approval. Standard Packaging: PE Bag. Packing Details: 400 pcs per carton, 11 Kgs, 48x32x28 cms. Setups: Included.